The all-new 2013 Mercedes-Benz A-Class is a big hit with buyers and it’s Germany’s favorite car in more ways than one. The new Mercedes-Benz A-Class has been wildly popular in Europe and has been awarded the most preferred car by ADAC (German Auto Club). The luxury compact has been awarded the public’s favorite car in the presigious “Gelber Engel 2013” (Yellow Angel 2013). The Germans know their cars well, and the all-new 2013 Mercedes A-Class is a car that has many things for buyers to like. Consumers in Germany look to the award as a sort of “seal of approval” by the auto club and more than a design and image award. The "Gelber Engel" takes into account criteria such as the vehicle's price-performance ratio, functionality, efficiency, safety and eco-friendliness. Close to 300,000 readers of the ADAC's Motorwelt magazine as well as users of the club's internet presence took part in this year's vote. Europe's largest automobile club, looked at 52 cars, all of which came on to the market in 2012 for the first time. 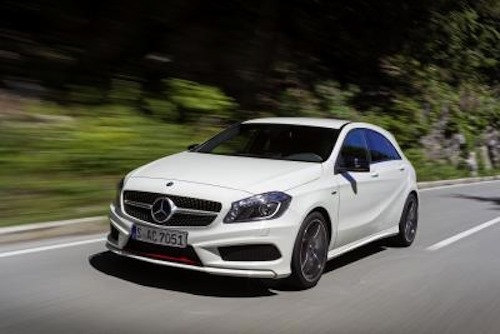 The new 2013 Mercedes-Benz A-Class beat all of these to the top spot and is thus the favorite car of the Germans. The Mercedes-Benz A-Class represents a new entry into the growing luxury compact segment and competes with the BMW 1-Series and the Audi A3. Prices in Germany start from $29,340 for the A 180 BlueEfficiency, and comes packed with luxury and safety features. It offers a sporty “emotive” exterior and an exceptionally high-quality feel to the interior. A total of 90,000 orders have already been received for the car and with an attractive price below $30,000 it’s no wonder it’s so popular in Europe. But there is more to the new A-Class than price. The new A-Class ranks high with the top safety testing from Euro NCAP for all-round protection for occupants in the event of frontal, rear or side collisions. But Mercedes doesn’t stop there. The German automaker goes far beyond the impact configurations defined as the basis for international type approval in Europe, the USA and Asia. Mercedes-Benz also conducts its own extremely stringent crash tests, such as roll-over and roof-drop tests. The base A-Class comes well appointed with features like air conditioning, Audio 5 USB, power windows, Headlamp Assist and 12-button multifunction steering wheel. But Mercedes has included optional features that are often found in more expensive models. Those include the Intelligent Light System, electrically adjustable front seats with memory function or dashboard finished in Artico man-made leather. The new A-Class also offers a new accessory range in the area of infotainment. The Drive Kit Plus for the iPhone provides access to the Digital Drive Style app, developed in-house by Daimler. Features include the advanced navigation solution from Garmin, with internet-based, real-time traffic information, online POI searches including Street View and 3D map display. Other functions include Facebook, Twitter and AUPEO! Personal Radio in Europe. Mercedes brings the latest youthful technology into the vehicle. With the integration of the iPhone, Mercedes-Benz is now able to offer the Facebook generation “its natural home on four wheels.” Along with Facebook, Twitter, the "Drive Kit Plus for the iPhone together with the Daimler app concept, brings further digital lifestyle services and content into the vehicle. Mercedes says it will include advanced navigation software from Garmin, with internet-based real-time traffic information, online destination searches and 3D map display. The all-new 2013 Mercedes-Benz A-Class also offers a variety of fuel-efficient gas and diesel engines with the latest technology. It brings a refined sportiness and agility and ride comfort that is typical of the brand. With everything that the new A-Class has to offer, the new luxury compact hatchback is a hit with a younger generation of buyers and is the favorite car of the Germans.